These sugar free Gluten Free Crepes are easy to make and incredibly versatile for a variety of meals. You can fill these sugar free flourless crepes with ham and cheese, lox and cream fraiche, fruit and yogurt, or sautéed vegetables. Experiment with different fillings and try them for breakfast, lunch, dinner, or dessert. 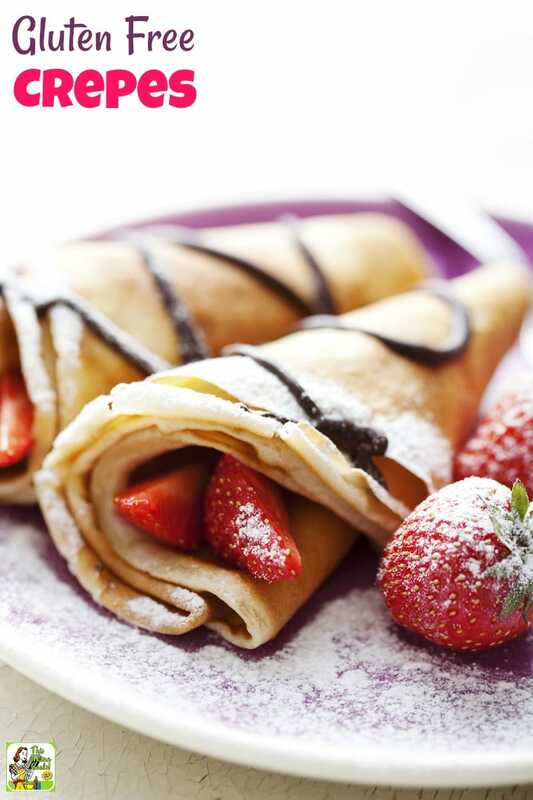 This gluten free crepe recipe can be served with strawberries and drizzled with chocolate sauce as a special dessert. 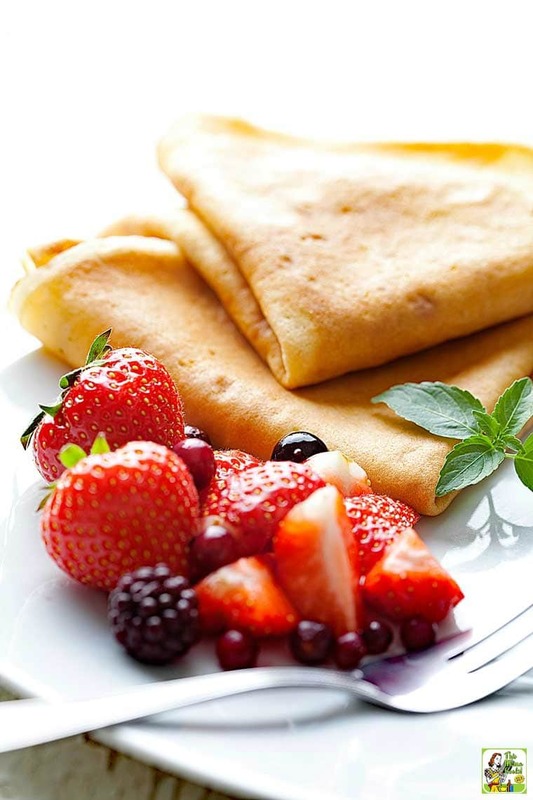 You can also use any any ripe fresh fruit like pears, blueberries or raspberries as a breakfast crepes recipe. You could also go crazy and serve up the crepes with Nutella and bananas – oh my! All would work as a romantic dish for Valentine’s Day or something you’d serve mom in bed for Mother’s Day. Whatever the occasion, keep this healthy crepe recipe in your cooking repertoire to treat your loved ones or for special events and parties. This gluten free crepes recipe is based on the No Flour, No Sugar Crepes recipe from Dr. Gott's No Flour, No Sugar Diet. The book is a guide to sensible eating that has helped thousands achieve and maintain their desired weight. No flour, no sugar – that's it. Dr. Gott's on to something, because bread and sugar cravings are huge problems for many people who are trying to lose weight. For others, they just feel better when they avoid refined sugars and flours. This easy crepes recipe would work for folks who are on gluten free and paleo diets (with a few easy substitutions), too. Dr. Gott also has a cookbook you should check out – Dr. Gott's No Flour, No Sugar Cookbook. Speaking of special events, if you’re serving these easy crepes for a special someone, spend the time to make your gluten free crepes as beautiful as possible. Fold the crepes over pleasingly. (Please use the good china, too!) Call on your inner chef and drizzle the chocolate sauce over the crepes using a squeeze bottle. Gorgeous! You can also sprinkle monk fruit powder or Swerve Confectioners Sugar over the crepes as shown in the pictures like you would with regular powdered sugar. Since both monk fruit and Swerve are natural no calorie sweeteners, it’s OK to indulge your sweet tooth a bit. Or you can leave the chocolate and sugar off the outside. Instead, smear some chocolate inside the crepe, and then fold over. Still as yummy, but no pressure to be Super Chef. Finally, leave a few sliced and whole strawberries to place in the folds of the crepes on the side of the plate as a garnish. Do this recipe for crepes up like they would in a five star restaurant! Your loved one will appreciate it so much. You want to use arrowroot powder and not arrowroot flour in this gluten free crepe recipe. Using low-fat evaporated milk significantly cuts calories while still delivering creamy sweetness. If you’re dairy free or on the lookout for a paleo crepes recipe, use unsweetened coconut milk instead of evaporated milk. I like both stevia powder and monk fruit powder in my cooking. However, I find that stevia gets very bitter when mixed with chocolate, so I avoid using it when I cook with chocolate. You can also use Splenda or Equal in this no sugar crepe recipe if you’re comfortable using either of those no calorie sweeteners. If you love crepes, invest in a 10-inch crepe pan. It’s totally worth it! Otherwise, a good 10-inch non-stick skillet is just fine. A little scared of cooking up a batch of crepes? The Frugal Chef does a terrific video on how to cook up a crepe starting at the 3:20 minute mark. Remember, practice helps. And you can eat any mistakes! They just won’t be as pretty. You can also use the chocolate sauce on poached pears or as a dip for fresh fruit. Remember that baking chocolate is high in fat, which means it still packs a fairly hefty calorie punch. So use this sauce sparingly. In a large bowl, beat eggs with an electric mixer until pale yellow and fluffy, about 2 minutes. Mix in milk, arrowroot, oil, baking powder, and salt. Spray a nonstick 9- or 10-inch skillet with vegetable oil spray and heat over medium-low heat. Add about 2 tablespoons of the mixture to the hot pan and tilt pan so the mixture is evenly spread over the bottom. Cook until bottom is lightly browned, about 2 minutes, then carefully lift crepe and turn over. Cook until second side is lightly browned, about 2 minutes more. Remove from pan and place between layers of parchment paper. Continue until all the batter has been used. Place chocolate in a non-reactive bowl. Place milk and monk fruit sweetener in a small saucepan over medium-high heat and heat until hot to the touch but not boiling. Pour hot milk over chocolate in bowl, add vanilla extract, and let sit a few minutes until chocolate has softened. Serve sauce immediately. Or cover and refrigerate up to one week. To serve, heat in microwave just until hot and liquid. 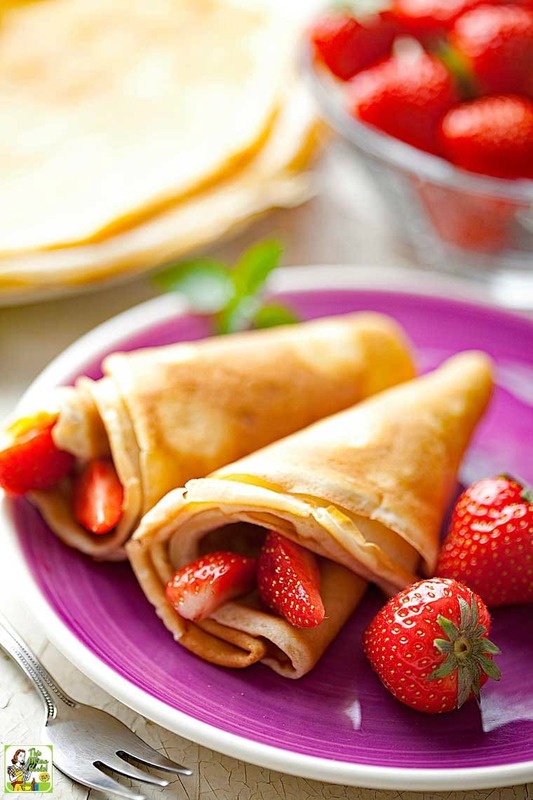 Divide strawberries evenly among the crepes, arranging them down the middle of the crepes, and roll the crepes up around them. 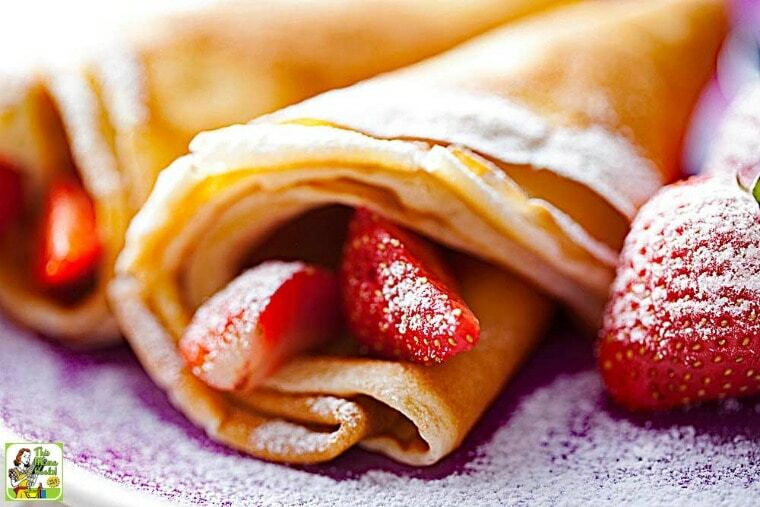 Drizzle about 2 tablespoons of chocolate sauce decoratively over each rolled-up crepe. Serve immediately. Originally published on February 7, 2007 and March 4, 2016. Recipe used with permission. Updated with new pictures and information. Posted in Breakfast, Desserts, Gluten Free, Recipes and tagged chocolate, monk fruit, Mother's Day, pancakes, Valentine's Day on February 5, 2019 by Anne-Marie Nichols. That’s what was indicated in the original recipe from the No Flour, No Sugar cookbook. But yes, you are right, they’re the same thing. We’ll have to give this one a try. My family enjoys crepes but my husband is a diabetic. I’m trying to lower the flour. Thank you. Thanks for this lightened version of crepes. Just found your blog; it’s fantastic. Very interesting. I’m supposed to be getting a review copy of this book, but I didn’t get it yet. It sounds perfect for my diet.